The swords in this chapter bear witness to 18 years (1829 to 1847) of the Ames family business. If we abide history in addition to studying the shape and composition of these magnificent swords, we find an interesting and faceted story. It’s a story of two brothers; Nathan Peabody Ames, Jr, and James Tyler Ames. It represents the early years of their collective transformation from blacksmith apprentices to successful mechanics, manufacturing pioneers, entrepreneurs, community leaders, philanthropists, official representatives of their country abroad, and industrialists extraordinaire – recognized around the world. It is during this 18 year period that the elder brother “N.P.” would lead the business and unwittingly prepare the younger James to lead a future, monumental commercial operation. This Ames chapter is distinct from this works other Ames chapter, as the swords illustrated are all marked in recognition of the company’s leader, N.P. Ames. Whether the address juxtaposed the company mark is “Springfield” (the earlier address) or “Cabotville” (the later address) is a matter of company evolution and municipal boundary history. Each sword pattern represented in this chapter has a reasonably well documented and published history. This is due in large part to Nathan Ames. He was both a strong advocate of his company’s technical abilities, and he communicated those abilities very well. Fortunately, his extant correspondence represents the development of these various patterns. Perhaps the unique aspect of the Nathan Ames correspondence is the added collaboration with his younger brother. Nathan was often away from home and his letters to James (and those from James to Nathan) sometimes offer insightful details of these particular swords, but generally informs the vicissitudes of the associated business at hand. 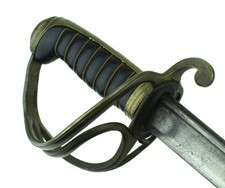 Annotated with the correspondence involving government purchasing agents (typically), we have a rich history of sword information that can be related to the military, political and economic issues of the time. These swords represent Ames’ effort and investment to satisfy the interests of various Federal bodies / military branches, state governments, and militia organizations through an interesting period of the Nation’s history. The “terminus” is represented by the merciful death of N.P. in 1847, when he would ironically fall victim to his own success. Of course, it is well documented that during Nathan’s 1840 trip to Europe he underwent a dental procedure that exposed him to mercury and a subsequent slow and painful death. These swords can be interpreted in a number of ways, but the historical record supports that they are attributable to the hard work and ingenuity of a team of brothers, well supported by a team of artisans, some documented, but others not. 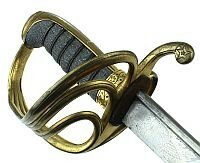 They remind of us of a time when a sword was an important accoutrement of an individual’s position and station, and a time when a sword was a symbol of honor and valor. These examples represent the beginning of the golden age of the American sword, superbly made by Ames, and they speak volumes. KH - My Thanks to Ron Maness for sharing his research and providing this excellent introduction. 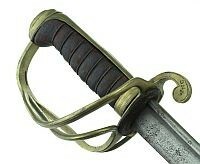 M 1833 Dragoon Officer Saber - Rare inspected model. Model: M 1833 Dragoon Offc. The infantry N.C.O. 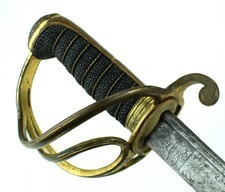 version of the Model 1832 short sword. Dated 1833. 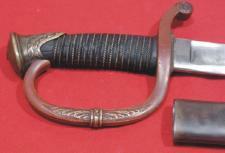 M 1833 Dragoon Saber - dated 1837.